Objective To evaluate pancreatic surgery as a model for high-acuity surgery in elderly patients for immediate and long-term outcomes, predictors of adverse outcomes, and hospital costs. Setting University tertiary care referral center. Patients Four hundred twelve consecutive patients who underwent pancreatic resection from October 1, 2001, through March 31, 2008, for benign and malignant periampullary conditions. Main Outcome Measures Clinical outcomes were compared for elderly (≥75 years) and nonelderly patient cohorts. Quality assessment analyses were performed to show the differential impact of complications and resource utilization between the groups. Results The elderly cohort constituted one-fifth of all patients. Benchmark standards of quality were achieved in this group, including low operative mortality (1%). Despite higher patient acuity, clinical outcomes were comparable to those of nonelderly patients at a marginal cost increase (median, $2202 per case). Cost modeling analysis showed further that minor and moderate complications were more frequent but no more debilitating for elderly patients. Major complications, however, were far more threatening to older patients. In these cases, duration of hospital stay doubled, and invasive interventions were more commonly deployed. Conclusions Quality standards for pancreatic resection in the elderly can—and should—mirror those for younger patients. Age-related care, including geriatric consultation, supplemental enteral nutrition, and early rehabilitation placement planning, can be designed to mitigate the impact of complications in the elderly and guarantee quality. The elderly constitute the fastest-growing age demographic in the United States. The US Census Bureau estimates that 12% of the population is currently 65 years or older. By 2030, this demographic will double in absolute number and represent 20% of the US population.1 Longer life expectancy, coupled with advancements in surgical techniques, has resulted in more elderly patients presenting for surgery.2 Surgeons and other physicians will wrestle with reasonable indications for surgery and its effect on patient morbidity, quality of life, resource utilization, and expenditures for this cohort. Standards for surgical care are receiving increasing scrutiny, particularly in high-acuity procedures such as pancreatic resection, in which patients are typically older, baseline patient risk is high, and complications are frequent, costly, and debilitating. New process and systems improvement initiatives rely on established quality indicators, the assessment of practice outcomes, and standardized perioperative management approaches.10-18 However, it remains unclear whether contemporary standards of quality for pancreatic resection are equivalent for young and elderly patients and to what extent such approaches can optimize outcomes for elderly patients. This analysis addresses these uncertainties and provides recommendations for achieving optimal outcomes when pancreatic resection is performed in older patients. Two fellowship-trained pancreatobiliary surgical specialists (M.P.C. and C.M.V.) performed 412 consecutive pancreatic resections from October 1, 2001, through March 31, 2008, including 272 proximal, 124 distal, 9 central, and 7 total pancreatectomies, for a full spectrum of benign and malignant periampullary pathological findings. For pancreatoduodenectomy, the most common indication was pancreatic ductal adenocarcinoma (109 patients [40%]), whereas distal pancreatectomy was performed most often for cystic neoplasms (54 [44%]). Central pancreatectomy was selectively applied to lesions of the body and neck for its ability to preserve pancreatic endocrine and exocrine function. Total pancreatectomy was reserved for lesions not amenable to limited pancreatic resection, most often for intraductal papillary mucinous neoplasms. The Carepath for Pancreatic Resection, a standardized clinical pathway for perioperative care, was used at our institution. This pathway, previously described in detail elsewhere, outlines a reproducible multidisciplinary approach to preoperative, intraoperative, and postoperative management.17,18 Geriatric consultation and specific age-related care were typically provided for patients older than 75 years. This includes evaluation of comorbid conditions, particularly cardiac and respiratory illness. Gerontologists also identify family support structures and discuss end-of-life and resuscitation preferences. Nutritional evaluation and cognitive and functional analyses are regularly performed. In the postoperative period, geriatric consultation is useful for fluid management, pain control, and prevention and treatment of postoperative delirium. These specific interventions were formally incorporated into our care pathway in 2006 but were frequently used in earlier years. Clinical and economic outcomes were compared between cohorts. 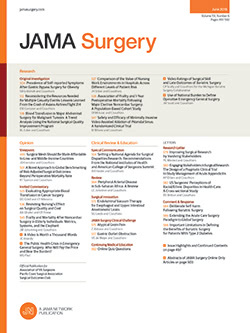 In addition to accepted baseline indicators of quality—complications, duration of hospital stay, and perioperative mortality—we explored other emerging measures of surgical quality, which have been defined previously.17 The incidence and severity of complications were defined according to the Clavien scheme, which describes 5 grades of clinical severity, based on escalating levels of therapeutic interventions required.22 Briefly, grades 1 and 2 events represent complications of minor severity, and grade 3A reflects a moderate complication. Grades 3B and 4 represent major complications, and grade 5 represents death. Beyond these traditional assessments, 2 other analyses—ratio of observed to expected (O:E) morbidity and deviation-based cost modeling (DBCM)—were performed to measure the incremental impact of increasing age on outcomes and to determine whether elderly status significantly alters the anticipated postoperative clinical course. The rationale and details of these analyses have been published previously.17-19,23 Using the actual incidence of postoperative complications and the mean Physiologic and Operative Severity Score for the Enumeration of Mortality and Morbidity (POSSUM),19,23 we evaluated surgical quality through variance in O:E morbidity. A ratio equal to 1.00 demonstrates expected performance. Ratios of greater than 1.00 suggest that the outcomes are worse than expected. Conversely, ratios of less than 1.00 suggest that the outcomes achieved are better than expected. Deviations from our standard care pathway were evaluated using DBCM to compare the clinical and economic impact of complications.18 For any given operation or procedure, DBCM links the severity of complications with the length of stay. Hospital costs for each deviation class were compared using a summary measure of cost efficiency that combines the relative proportion of each deviation category (on course to major) with its median hospital cost.18 This provides the weighted average median cost per patient, reflecting the direct contribution of complications to costs. Categorical variables were compared using the χ2, Fisher exact, and univariate logistic regression statistics; continuous variables were compared using analysis of variance, unpaired t tests for independent variables, and simple linear regression. Differences between O:E morbidity were assessed using the Hosmer-Lemeshow χ2 goodness-of-fit method.24 Factors associated with morbidity were calculated by cross-tabulation using χ2 and Pearson correlation tests. We considered P < .05 to be statistically significant. Computations were performed using commercially available software (SPSS 14.0 [SPSS, Inc, Chicago, Illinois] and Stata 8.2 [StataCorp LP, College Station, Texas]). From October 1, 2001, through March 31, 2008, pancreatic resection was performed in 76 elderly patients (18%) and 336 nonelderly patients (82%). Elderly patients had significantly lower preoperative albumin levels and median body mass indexes (Table 1). Several measures of patient acuity were significantly worse among the elderly patients. Elderly patients were twice as likely to present with American Society of Anesthesiologists classifications of III or IV (odds ratio, 2.17; 95% confidence interval [CI], 1.28-3.68; P = .004), and the median POSSUM physiologic severity score was significantly higher (25 vs 17; P < .001). Karnofsky scores of 80 or 70 were more frequent, but resections were not performed for patients with scores of less than 70. Comorbidity rates, except for chronic obstructive pulmonary disorder, were equivalent. Elderly patients harbored malignant neoplasms significantly more often (64 of 76 patients [84%] vs 168 of 336 [50%]; P < .001), with pancreatic adenocarcinoma being the most common indication for nonelderly (96 patients [29%]) and elderly (35 [46%]) patients. Nonelderly patients more often presented with pancreatitis or other benign conditions (12 patients [16%] vs 168 [50%]). Operative outcomes were statistically equivalent between the age groups (Table 2). Blood loss (median, 350 mL) and operative time were benchmarks for both cohorts, whereas the number of individuals receiving blood transfusions was significantly greater among elderly patients. Surgical performance (POSSUM operative severity score) was equal, indicating that, despite higher patient acuity among elderly patients, equivalent operative conduct can be achieved. Among the 76 elderly patients, 55 (72%) developed at least 1 complication of any severity, but two-thirds of these (39 of 55) were minor in scope. Oliguria/hypotension (37 patients [49%]), delirium (22 [29%] vs 30 nonelderly patients [9%]; P < .001), wound infections (16 patients [21%]), and respiratory distress (12 [16%]) were common. The median hospital duration was 9 days. Although most returned home (19 [25%]) or required visiting nursing assistance (22 [29%]), 34 patients (45%) required further treatment at rehabilitation facilities. Hospital readmission and reoperation were infrequent (11 patients [14%] and 8 [11%], respectively); only 1 elderly patient (1.3%) died (of myocardial infarction). The median total hospital cost for these patients was $19 852 (range, $9873-$164 756). Clinical outcomes were compared directly between elderly and nonelderly patients (Table 3). Overall, postoperative complications were significantly greater among elderly patients, although this is explained by differences in rates of minor complications (39 elderly patients [51%] vs 112 nonelderly patients [33%]; P = .003). Moderate and major complications (grades 3-5) were equivalent (16 elderly patients [21%] vs 49 nonelderly patients [15%]; P = .11). As a result, more antibiotic therapy, blood transfusions, and parenteral nutrition were required by the elderly. Moreover, elderly patients showed a trend toward increasing rates of image-guided drainage and required reoperation 3 times more often (odds ratio, 3.18; 95% CI, 1.25-8.07; P = .01). These factors contributed to a 1-day increase in median hospital stay and higher rates of rehabilitation placement. Detailed economic analysis demonstrates that pancreatic resection was somewhat more costly among elderly patients, translating to $2202 (or roughly 12% more) per patient (Table 4). This cost increase largely reflects increased laboratory evaluations, pharmacologic interventions, duration of intensive care unit stay, and the additive costs of an additional day of hospitalization. Multivariate logistic regression analysis of the overall cohort confirmed advanced age (P = .03) and intraoperative blood loss (P = .004) as predictive factors associated with postoperative morbidity. Advanced age was associated with a 2-fold increase in the likelihood of morbidity (odds ratio, 2.05; 95% CI, 1.07-3.93; P = .03). This risk-adjusted analysis also suggests that elderly patients, on average, incur a 2-day increase in hospital stay (β = 2.35; 95% CI, 1.03-3.67; P < .001) and a $9800 increase in total hospital costs (β = $9774; 95% CI, $4117-$15 431; P < .001). When elderly patients were scrutinized separately on univariate analysis, type of resection, lower preoperative hematocrit level, presence of a malignant neoplasm, and operative time were associated with any level of morbidity. However, these were not significant after multivariate analysis. Complications were broken into 2 strata, minor and moderate/major, to determine which factors predict complication severity. There were no identifiable risk factors for minor complications. However, intraoperative blood loss was the only significant factor (P = .03) for moderate/major complications. For the complete time frame, the overall O:E morbidity ratio was 0.94, steadily improving from 1.24 in 2001 to 0.87 currently.17 The O:E ratios were calculated separately for the elderly and nonelderly patient cohorts. Although elderly patients demonstrated higher expected and observed morbidity rates (both P < .001), calculated O:E ratios were equivalent. This ratio declined more significantly during the 6-year time frame among younger patients (1.27 to 0.84), whereas elderly patients experienced more modest, but real, improvements (1.15 to 0.93). When DBCM was applied, the incidence and severity of deviations was substantially greater among elderly patients (Table 5). Within the on-course category, elderly patients had longer hospital stays by 1 day (P = .03); however, costs were similar. These metrics were equivalent for minor deviations. Moderate deviations were only marginally more severe and costly. Major deviations, however, were far more consequential to older patients. Hospital duration nearly doubled, and staggering cost discrepancies resulted. Collectively, these differential outcomes are reflected in the weighted-average median hospital duration and cost, which depicts the full impact of complications. The overall impact of complications in elderly patients was a 2.2-day increase in duration of hospital stay and a $9577 cost increase per patient, quite consistent with our risk-adjusted model described in the “Traditional Quality Analysis” subsection. Pancreatic resection, today, like other operations, can be performed safely and frequently in elderly patients.12,29,30 This study demonstrates that a substantial 18% of all resections in our specialty practice were for elderly patients; however, operative mortality (1%) exceeded benchmark standards for pancreatic resection at high-volume centers (3.8%).14,32 Furthermore, although the overall rate of complications was high, major morbidity was infrequent (21%). Intraoperative blood loss, rather than age, was the strongest predictor. High standards of surgical care were similarly achieved for other clinical and economic metrics: hospital stays were short, use of the intensive care unit was rare, and costs were contained. These outcomes were scrutinized to determine whether traditional standards of quality in elderly patients rival those of younger patients. Our initial experience demonstrates that older patients have significant increases in complications, resource utilization, duration of hospital stay, and costs. However, deeper analysis—using the O:E morbidity calculations and DBCM—reveals that these outcomes depend on several factors. The O:E analysis demonstrates that, overall, outcomes were actually slightly better than expected. Over time, surgical performance also improved considerably for both groups but was more impressive among the younger cohort. One explanation for this phenomenon is the implementation of a detailed clinical pathway and the adoption of several process and system improvements.17 These initiatives, which were generally oriented to the requirements of nonelderly patients, helped reduce thromboembolic, respiratory, infectious, and intra-abdominal complications. However, the present analysis has brought to light the following 4 themes, not originally addressed in our standardized care pathway, which affect elderly patients disproportionately: postoperative delirium, blood transfusion, supplemental nutritional support, and postoperative disposition. Analysis using DBCM demonstrates that the severity of complications also dictates clinical outcomes. Minor events, although more frequent in the elderly, had no measurable effect on clinical outcomes or costs. In this deviation category, morbidity, duration of hospital stay, and costs matched the established benchmarks of younger patients. Moderate complications resulted in more therapeutic interventions and a marginal increase in hospital stays. Major complications, however, were considerably more debilitating among older patients. Hospital stays were nearly doubled, and elderly patients regularly required more invasive interventions to shepherd them to full recovery. This reflects early vigilance and relative aggressiveness to control the devastating effects of major complications in the elderly, who have less reserve to overcome such predicaments. That intraoperative blood loss is the only defined association with the development of major complications speaks to the importance of the original operative endeavor and suggests that specialized expertise in these operations is requisite for optimal outcomes. In sum, DBCM estimates that, overall, an elderly patient will experience a 2.2-day increase in hospital stay beyond that of younger patients, costing an additional $9577. There are inherent limitations to this analysis. This study was conducted within a single specialty practice at a high-volume institution, preventing comparison across the variety of practices performing these operations. Patients may differ with respect to comorbid illness, pathological disease, surgical techniques, and management strategies. Second, posthospitalization costs, particularly rehabilitation placement, likely are considerable. Therefore, the reported cost differential between elderly and nonelderly patients underestimates the overall impact. Third, we defined elderly patients as those 75 years or older. This cutoff, although seemingly arbitrary, was selected because many physicians consider patients older than 75 years to be of too high a surgical risk, particularly for invasive operations with considerable blood loss and great propensity for postoperative morbidity. Furthermore, although people 65 years or older now represent the fastest growing segment of our society, those 75 years or older will create the greatest demand for health care in the future. Little is yet known about surgical outcomes among this cohort, particularly for pancreatic cancer, for which few patients are afforded the option of surgery. Finally, people aged 65 to 75 years are increasingly regarded as surgical candidates. When successful, surgery can expect to extend these patients' lives another 10 to 15 years or more. A consolidation of people older than 65 years with those aged 65 to 75 years is appropriate because previous studies show that these age groups have similar outcomes. For these reasons, we chose an age cutoff of 75 years, although we acknowledge that a more (ie, ≥80 years) or less (ie, <65 years) stringent analysis may provide different outcomes, but likely would not significantly alter the concepts borne out herein. In addition, this study was limited to pancreatic resections because these operations represent high-acuity procedures with a significant risk of morbidity based on heterogeneous patient demographics and the natural history of the pathological disease encountered. It remains unclear whether similar encouraging outcomes will manifest in elderly patients who undergo other high-acuity operations (ie, hepatectomy, esophagectomy, and abdominoperineal resection). Nevertheless, the principles of this analysis can easily be extended to such scenarios. Finally, this retrospective analysis did not examine or compare long-term functional and quality-of-life metrics, an emerging concept deserving of detailed prospective analysis. Despite these limitations, the findings of this study have prompted us to adopt 4 age-related process improvement measures to target elderly patients at risk for hemodynamic compromise, postoperative delirium, and infectious complications. Specifically, we now use geriatric consultation preoperatively for all patients 75 years or older to address cardiorespiratory conditions, adjust plans for fluid resuscitation and pain control, and limit postoperative delirium. These dedicated gerontologists, who are familiar with complications in high-acuity surgery, provide additional evaluation of patients' cognitive and functional status. Unlike anesthesiologists and surgeons, they are trained to address important but underrecognized issues that profoundly affect surgical outcomes. These include delirium, dementia, depression, anorexia, skin breakdown, polypharmacy, glucose intolerance, and the multifactoral interactions that affect cardiorespiratory, digestive, and neurocognitive function. Other disciplines trained in the assessment and management of these issues can help achieve optimal outcomes but probably at higher cost and without access to the venues of postacute care that are more readily available to geriatricians. Therefore, we endorse that all patients undergo geriatric evaluation and comanagement, believing that this does not supplant the assessments of other specialists but instead augments optimal care. As has been our practice, all patients, elderly and nonelderly, routinely undergo preoperative evaluation for anemia and bleeding diatheses. When abnormalities are discovered, further evaluation of causality is performed, and values are corrected before resection is performed. Transfusion is applied more liberally for elderly patients in the operative and postoperative settings. All patients 75 years or older now receive prophylactic placement of feeding jejunostomy tubes to reduce reliance on total parenteral nutrition with its attendant risks of infection and thrombosis. There have been few adverse events associated with this practice. A single elderly patient had the use of an externally damaged jejunostomy tube aborted in the early postoperative period. Other complications, such as gastrointestinal tract bleeding, obstruction, bowel ischemia, or site infections, have not been observed. Finally, elderly patients undergo early postoperative disposition planning during the initial gerontology consultation to facilitate the swifter transition from the acute-care hospital setting. In summary, this study suggests that current standards for pancreatic resection in the elderly can and should mirror those for younger patients. However, these results should be interpreted cautiously. We treated a carefully selected population that was referred, largely by gastroenterology specialists, for surgery at a multidisciplinary specialty center, inferring an element of referral bias. Nevertheless, the results of this study should broaden current considerations for operative candidates in this domain. We believe that regular geriatric consultation, incorporated into a standardized care pathway, can be a model to improve other high-acuity elective operations for this cohort. Correspondence: Charles M. Vollmer Jr, MD, Department of Surgery, Beth Israel Deaconess Medical Center, 330 Brookline Ave, Stoneman 9, Boston, MA 02215 (cvollmer@bidmc.harvard.edu). Accepted for Publication: October 15, 2008. Author Contributions:Study concept and design: Pratt, Schreiber, Lipsitz, and Vollmer. Acquisition of data: Pratt, Gangavati, Agarwal, Callery, and Vollmer. Analysis and interpretation of data: Pratt, Gangavati, Lipsitz, and Vollmer. Drafting of the manuscript: Pratt and Lipsitz. Critical revision of the manuscript for important intellectual content: Pratt, Gangavati, Agarwal, Schreiber, Lipsitz, Callery, and Vollmer. Statistical analysis: Pratt. Obtained funding: Pratt and Lipsitz. Administrative, technical, and material support: Agarwal, Schreiber, Lipsitz, Callery, and Vollmer. Study supervision: Gangavati, Lipsitz, Callery, and Vollmer. Funding/Support: This study was supported by a Clinical Research Fellowship Award from the Doris Duke Charitable Foundation (Dr Pratt), the PASTEUR program (Dr Pratt) and the Office of Enrichment Programs (Dr Pratt) at Harvard Medical School, the Edyth and Irving S. Usen and Family Chair in Geriatric Medicine at Hebrew Senior Life (Dr Lipsitz), and grant POI AG004390 from the National Institute on Aging (Dr Lipsitz). Additional Contributions: Gail Piatkowski, BS, Kathleen Murray, BS, Elizabeth Wood, BS, and Kenneth Sands, MD, MPH, of the Department of Health Care Quality Outcomes at Beth Israel Deaconess Medical Center, provided support and assistance for this study.